Welcome to Copenhagen where your wondrous journey begins with a two night stay. From its humble origins as a fishing village to its heyday as the glittering capital of the Danish Empire and its current position as one of the world’s premier design capitals, the stories and characters of Copenhagen’s history can be found in its sumptuous palaces, copper-roofed town houses and atmospheric cobbled squares. Take a cruise through the picturesque canals and see the city’s many iconic attractions including Christiansborg Palace, the remarkable Black Diamond Library, and the Little Mermaid sculpture. Alternatively, visit the spectacular sights of the Tivoli Gardens. Tonight, savour your welcome dinner at one of Copenhagen’s finest restaurants. Fly to the trendy Swedish capital, Stockholm. Said to be one of the most beautiful capital cities in the world, Stockholm is built on 14 islands connected by 57 bridges and looks proudly onto the Baltic Sea. The beautiful architecture, lush greenery, fresh air and proximity to the water are distinctive traits of this city. Spend the next two nights in Stockholm. With your expert local guide discover City Hall with its spire featuring the golden Three Crowns, one of Sweden’s most famous buildings. You’ll also see the Riddarholm Church and the Royal Palace. Then, visit the Vasa Ship Museum, where the 17th century warship ‘Vasa’ is now housed after it tragically capsized and sank on its inaugural voyage in 1628. 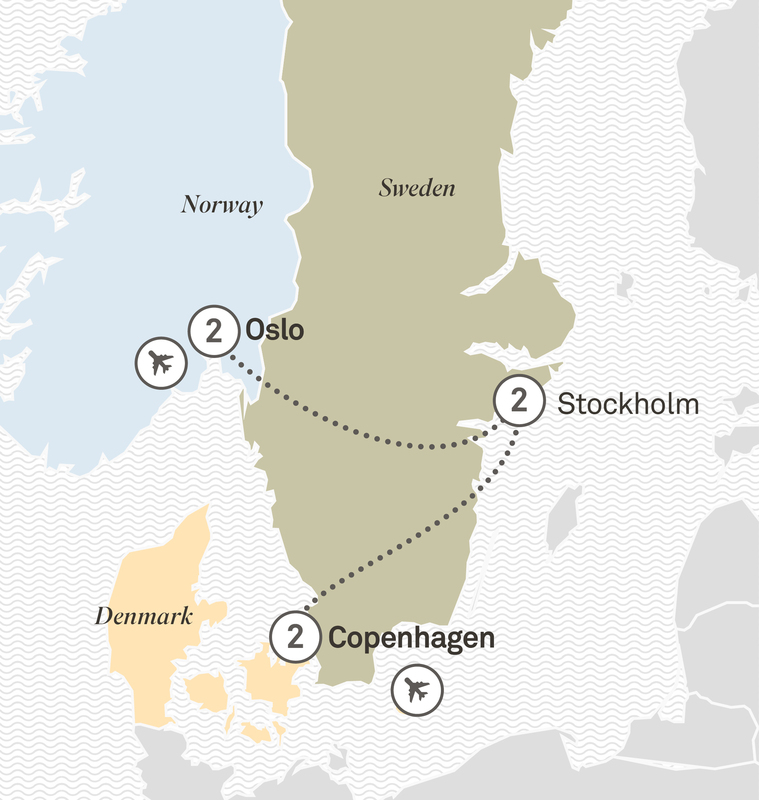 Take a short flight to Oslo, the capital of Norway. A thriving metropolitan capital surrounded by forests and fjords, Oslo is a modern and diverse city. Upon arrival you’ll be met by a local guide for a sightseeing tour before arriving at your hotel for a two night stay. From the 8th to the 11th century, the Vikings started their journey from their over-populated fjords across Europe, looking for land and trade. Discover their amazing history during your visit to the Bygdoy Peninsula, home to three famous museums honouring the rich nautical heritage of the Norse race and its warrior ancestors. Wander the Viking Ship Museum, the Kon-Tiki Museum and the Fram Polar Ship. Fram is the strongest wooden ship ever built and still holds the records for sailing farthest north and farthest south. Step on board the ship and see how the crew managed to survive in the coldest and most dangerous places on earth, the Arctic and Antarctica. Celebrate your wonderful journey at tonight’s farewell dinner. Depart after breakfast. It's the end of your journey, but the start of a lifetime of wonderful memories.